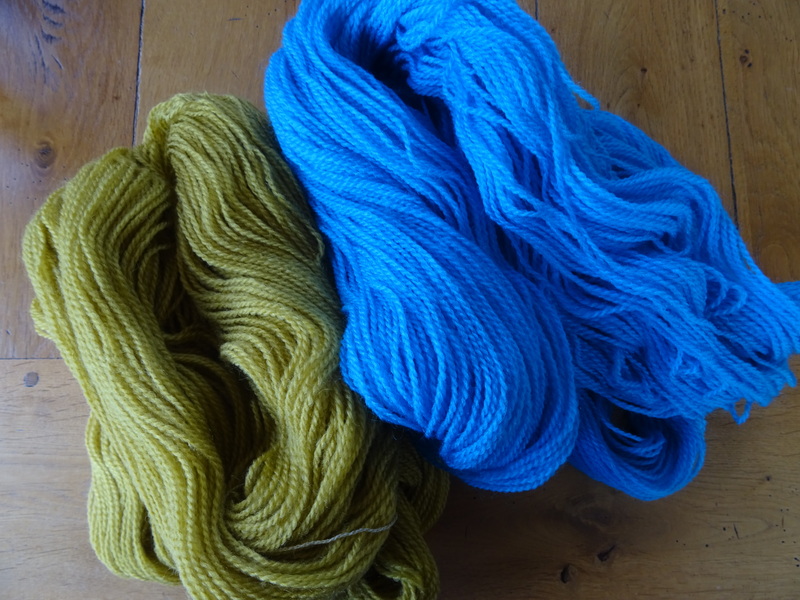 I bought some Rosarios 4 Bijou yarn in Portugal (from Ovelha Negra a wonderful shop). It is super bulky with a varied thickness and absolutely lovely to use. As soon as it was on my hook it flowed! So I wasted no time in making something with it which reminded me of our holiday in Northern Portugal. Probably the best evening we had was the first night, it was pouring down with rain but we had the most spectacular view of the Luis I Bridge over the River Douro. It is known as the Eiffel Tower of Portugal, and is constructed from lots of grey steel. 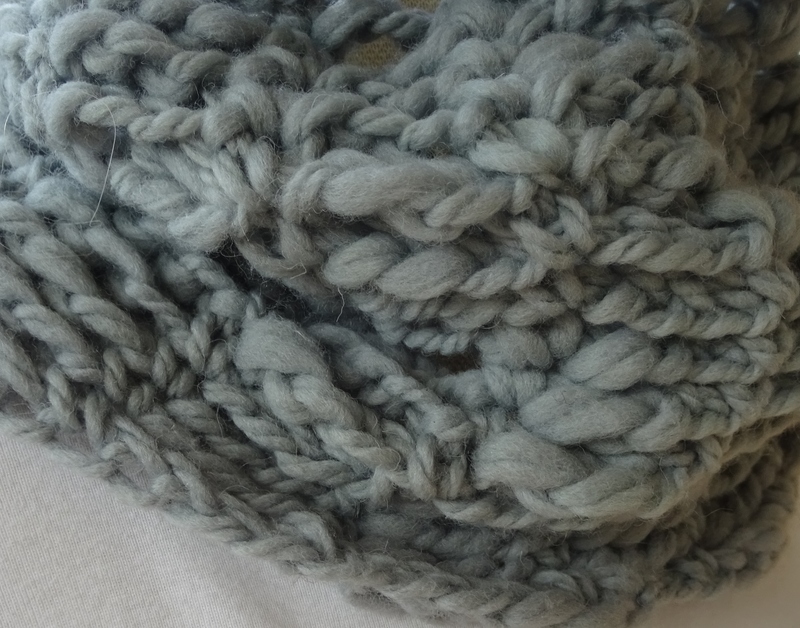 The stitch is simple and shows off the yarn beautifully, it is so simple it took only a few hours to make. It is also adaptable, I made it using Bijou but you can make it in any yarn as long as you use the correct hook size and start with a chain which is a multiple of 4. Simple., beautiful and very useful. Thank you Portugal! I had a fabulous day out at Yarndale but I had only recently returned from a holiday in Northern Portugal and my mind was still there. The holiday was a short river cruise on the Douro followed by a short stay in a Pousada. Prior to going I asked around on Ravelry to see if anyone could give me ideas of yarn shops to visit during my free time (a few hours on the first day) in Oporto. So I was fore-armed. Unfortunately things don’t always go to plan and my idea of having 3 hours free to wander Oporto on the day we arrived dissolved when we were whisked off for a coach tour of Oporto and a port wine tasting (and I love white port – so I wasn’t too disappointed!). However, the tour included 20 minutes of free time in an area very close to one of my ‘tips’. So I wasted no time in searching out ‘A Vida Portuguesa’. It is a lovely old shop with lots of beautiful items all made in Portugal. Unfortunately my enquiries drew a blank – I was advised they had no yarn. As the time was ticking away rapidly, I felt quite low, my only possible chance of finding yarn in Portugal had diminished substantially…. or so I thought…. I unexpectedly I found a fabric shop/haberdashery on a street corner so took my chances and jumped in. After an interesting discussion consisting mainly of gesticulation, I was told to go around the corner and across the road (I have no idea how I worked this out as my Portuguese is extremely limited!). By now I had only 2 minutes free time left but I ran across the tramlines and into the shop……which turned out to be a fabric/haberdashery/yarn shop. It took only a quick peruse of the shelves to see there was no Portuguese wool – it was all acrylic. Nevertheless I asked and someone who could speak enough English let me know they didn’t have any local Portuguese yarn. My first yarn hunt had drawn a blank but I was happily surprised at having found not one but two crafty shops in a small area of Oporto. 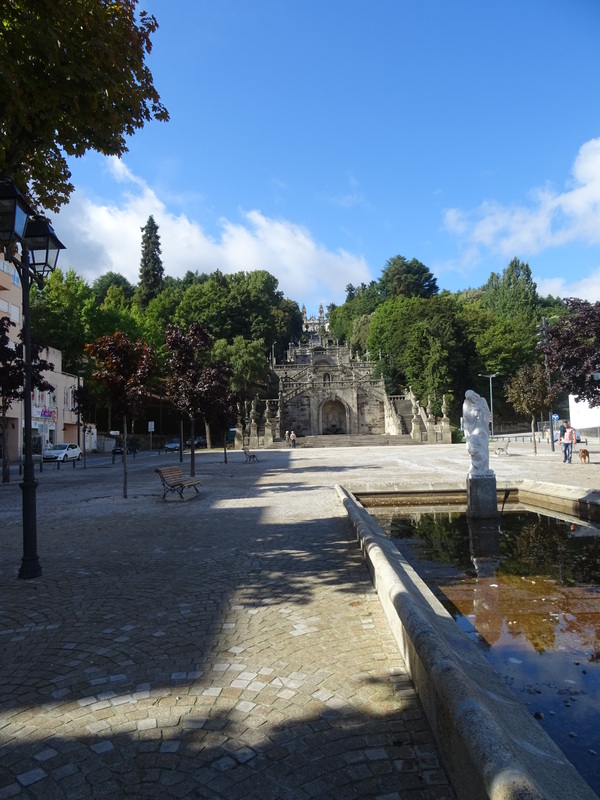 Two days later we visited Lamego – a small town famous for the sanctuary of Our Lady of Remedies and its long staircase down to the town (685 steps and yes I walked down but I didn’t count them! Thank heavens they didn’t ask me to walk up!!!). After the long descent (which reminded me of my last fire drill from the 24th floor of the building I used to work in! ), we wandered through the main parts of Lamego and then took a side street and lo and behold I found Casa Das Las on Rua Olaria – yes a yarn shop!!!! After the usual gesticulations (I was getting used to this!) I found some yarn in hanks that was 50% Portuguese wool. I was surprised to find it was sold by weight and priced by the kilo. 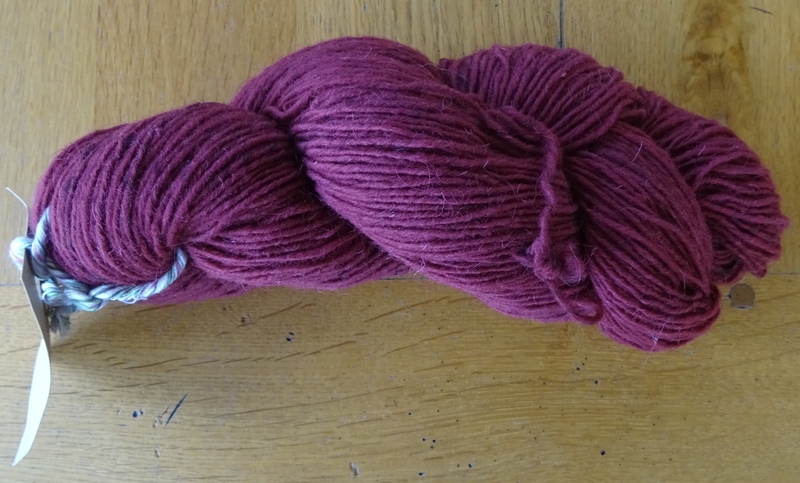 I chose 2 colours and found they weighed about 240g for a total cost of €9.37. Suddenly I felt I had achieved my goal of finding Portuguese yarn. Apologies for the quality of this photo – it was taken on my phone and I made a complete hash of it! I was now on a high and decided I would like to revisit A Vida Portuguesa as it was a lovely shop, old and characterful, and full of local Portuguese goods. I ascended the beautiful old wooden staircase and just at the top I found some lovely yarn! Just a few skeins in a basket but this was clearly handcrafted and gorgeous! 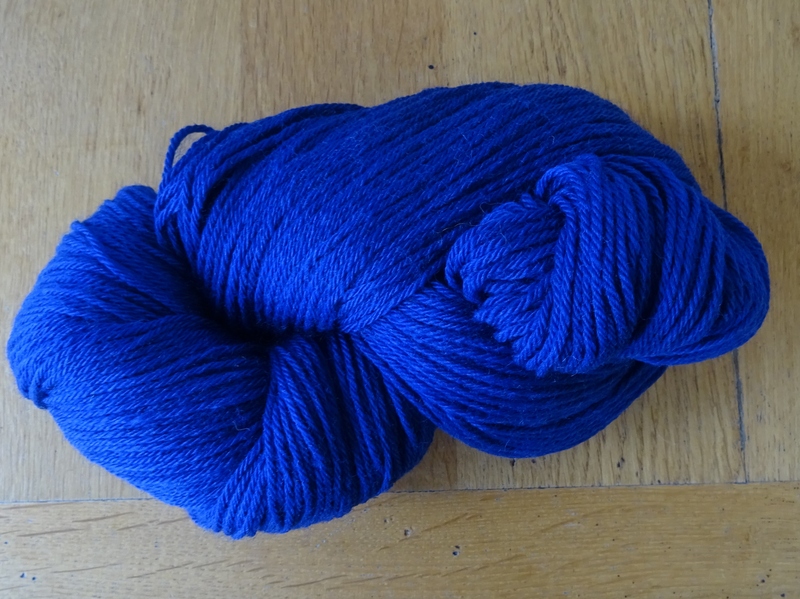 So my second yarn purchase of the day – and only 8 euros! The next day we visited Braga – a larger town. Again we had some free time ….did I tell you about the fantabulous pastries in Portugal? Well I went in search of one of the pastry shops, which are everywhere, and lo and behold almost next door to the first pastry shop I found was a wool shop, no signage but plenty of wool (on Rua de S Marcos). Again the language barrier was overcome with gesticulation and a clear love of La (wool) and I was shown a section of hanks of 100% wool. I chose a hank and this was weighed and priced as before. 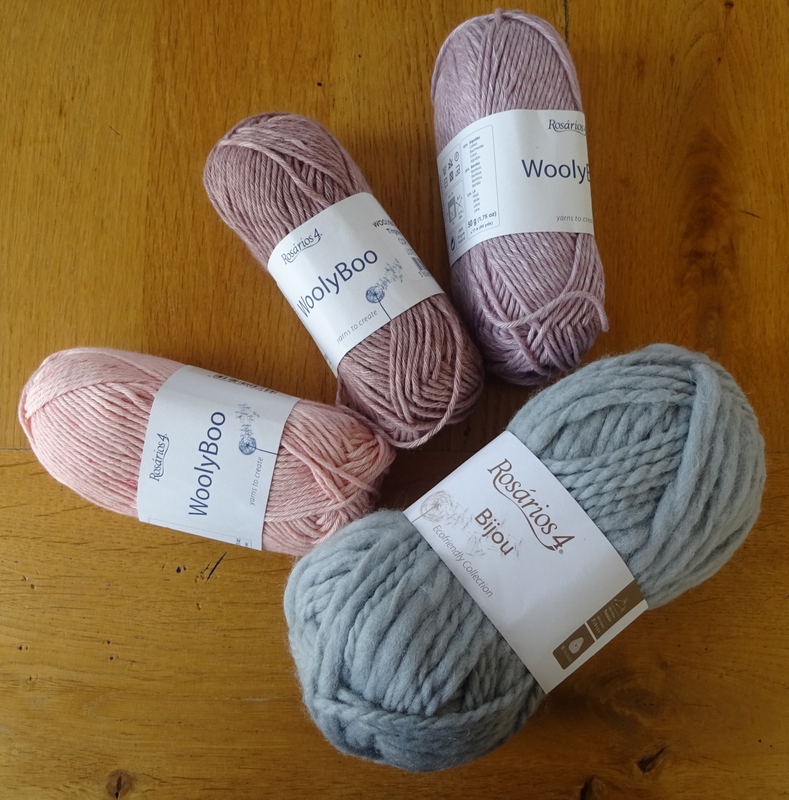 You can imagine how happy I was by now – 4 yarn purchases in a few days!!!! Our last trip was to Guimaraes, a UNESCO world heritage site with a beautifully preserved medieval centre. It has lots of characterful buildings, restaurants and shops….and very strangely I found 2 yarn shops, much the same as the ones in Lamego and Braga. 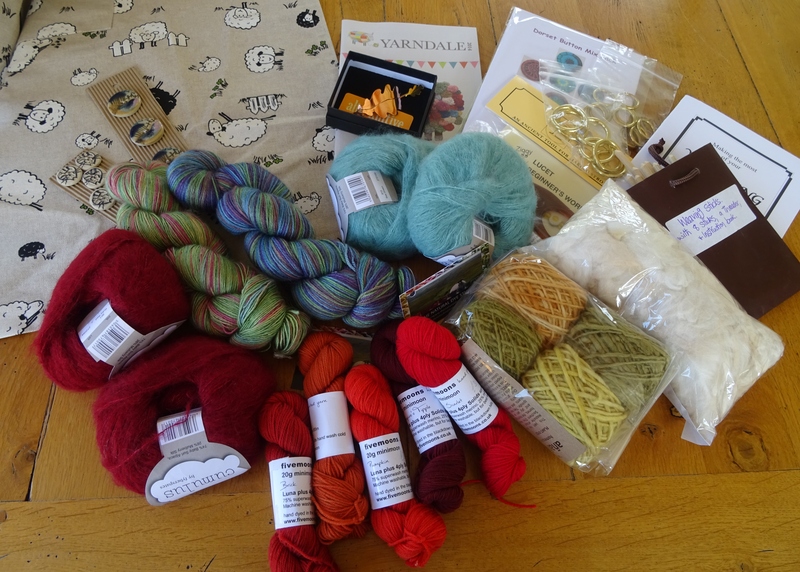 I was extremely restrained and decided not to buy any more yarn, maybe the size of my suitcase helped in this decision! But I thoroughly enjoyed finding yet more yarn shops and I also spotted some small handcrafted crochet shops, primarily baby clothes but definitely hand made. Finally, I fell in love with Guimaraes embroidery – which I found everywhere. Traditionally in black, red, blue or cream on cream linen. 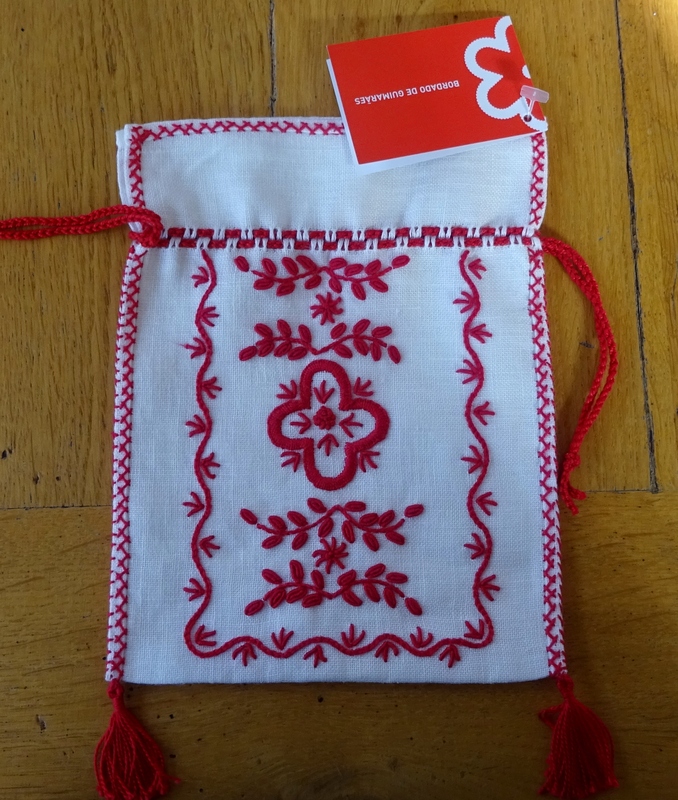 The best shop I found was a co-operative and I was tempted to purchase a lovely embroidered pouch bag – I love how the drawstring is crocheted! And this was small and flat, so fitted easily in the suitcase! So Northern Portugal has been very rewarding for a yarn addict. 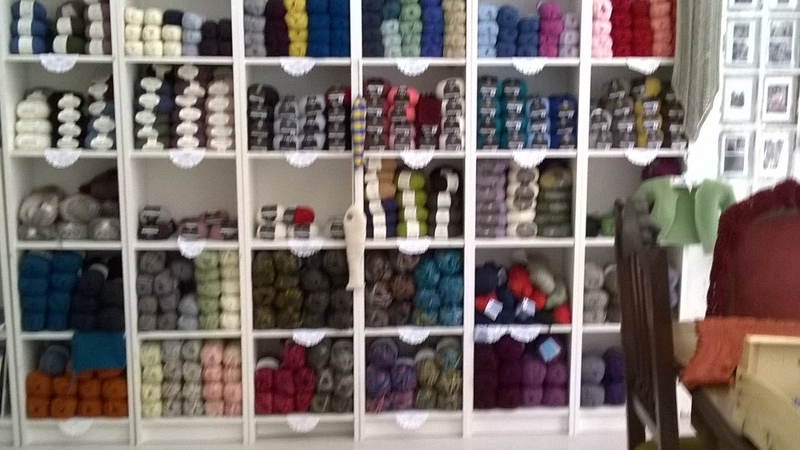 It is clear that there are more plentiful yarn shops than in the UK (much more plentiful). I just hope it stays that way. And I must thank my husband, he was very patient as I searched out all the yarnie goodness in Northern Portugal and I love him to bits! PS I didn’t mention it but the prices of everything are excellent, I can’t recall ever buying a bottle of beer (Super Bock) for only 70p!!! Visit Northern Portugal now, before it gets too commercial. 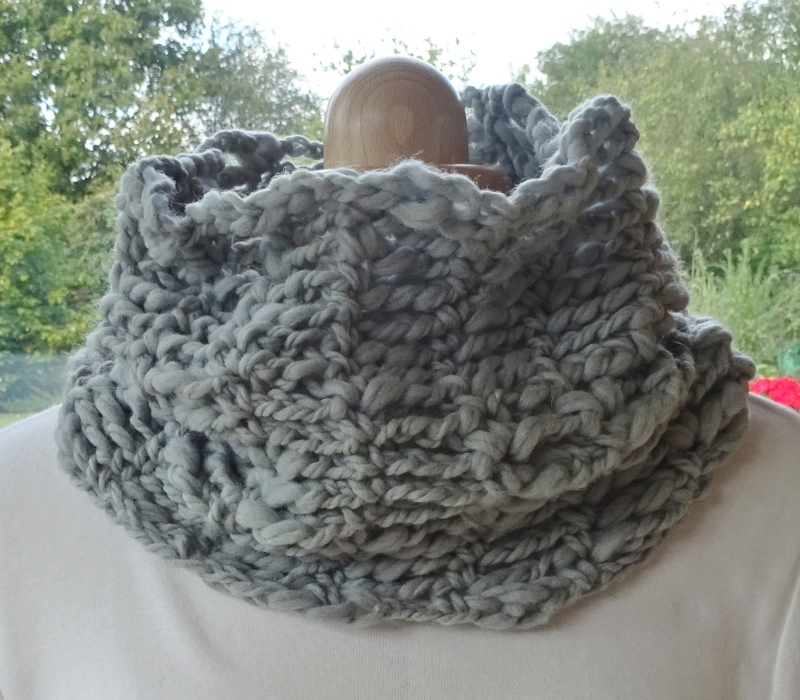 PPS I have been working with some of the Rosarios 4 yarn and there is a cowl pattern almost ready to publish…. a fabulous reminder of my yarn adventure in Northern Portugal! 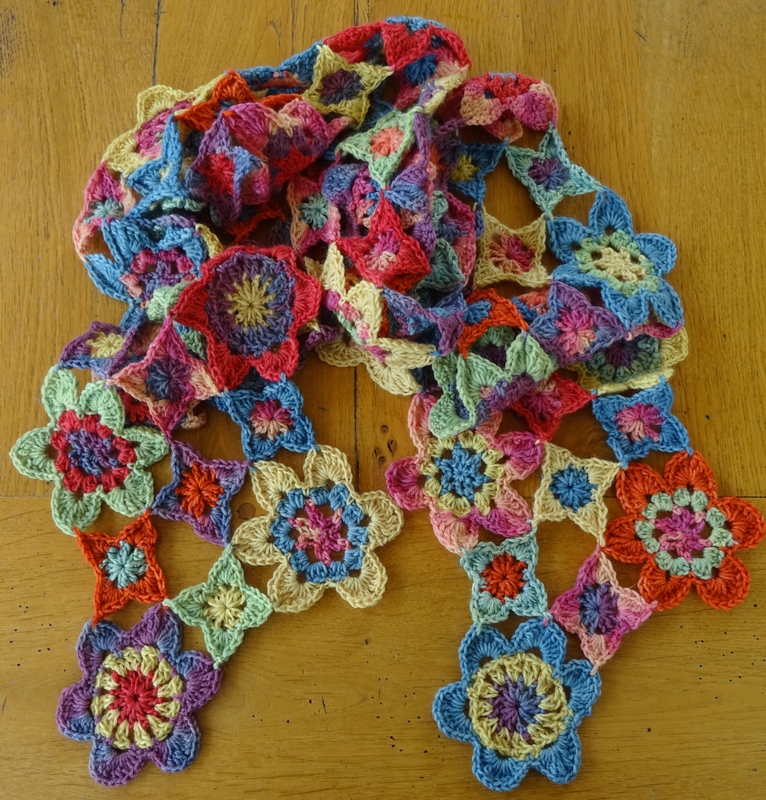 Today is International Crochet Day, what are you crocheting?